Well we guess we can get one more post off today before tonight's festivities and 2009 comes to an abrupt end. We wanted to do a quick summary of some of the recent Magic the Gathering Promotional cards that are out there. First off, you guys will want to head out to a Friday Night Magic (FNM) at your local participating store in February to get your paws on this very awesome foily piece of goodness . . 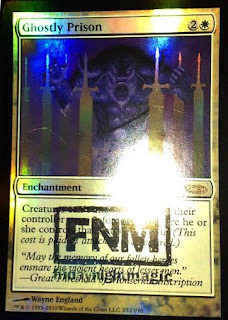 Need the list of previous FNM promo cards ? - Click HERE for our last article. If you happened to hit the pro-tour circuit, you may have saw this card . . . 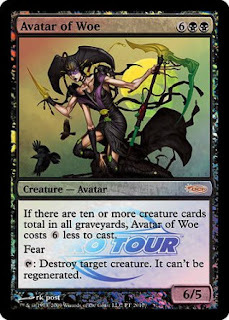 If there are ten or more creature cards total in all graveyards, Avatar of Woe costs 6 less to cast. And finally, if you happened to have provided your knowledge and services as a Judge at an organised tournament, you have our thanks / appreciation as well as these promo cards . . .
Those are some very kewl arts and we would love to get 'em. That being said, we would trade deck-sets of all of these to find this under our Christmas tree. A final word to those players we may know heading out to a special New Year's event at the local gaming store - best of luck and have fun (we would go but it would considered rude of us to leave a housefull of guests back home eating all of our double-chocolate Oreo cookies and drinking our Rootbeer. Good Day peeps, We hope you are having (or had) a great Holiday break. We are jumping in once more to blog land to get one more post off before year's end. 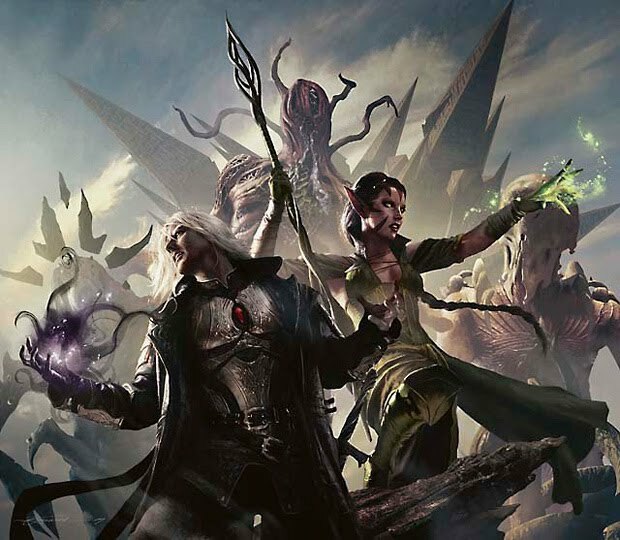 We wish to let you all know that we are still very much alive (yes we have not posted for a week), and want to catch up with any new Magic the Gathering news, spoilers and rumours. As for news, there is none. As for spoilers, specifically the Worldwake or Rise of the Eldrazi, there is none either. That being said, there was a bit of excitement on the forums just the other day where someone claimed to have a uncut sheet of foil Rise of the Eldrazi cards (the next set after Worldwake), but he was never heard from again . . . we strongly suspect WoTC corporate ninjas were involved in his disapearence. As there really is nothing new to yatter about, we will turn our attention to speculation about what the next set release will hold for us. We realise that Worldwake is not due out for about a month from now, but we really are dying in anticipation for any rumours or spoilers. 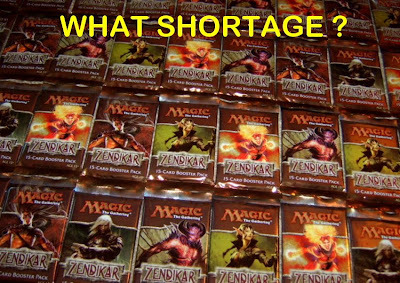 You may recall this POST in November when we had yattered about the Rise of the Eldrazi announcement. In this post, we also spoke about the upocmming novel 'Zendikar: In the Teeth of Akoum' by Robert B. Wintermute. We thought it prudent to go over the plot summary to sift through any clues as to what we may expect in Worldwake - let's have a look again . .
What catches our attention in the above is the reference to the Eye of Ugin. This name was contained within the flavour text of Ghostfire, a Futuresight uncommon. There had been quite a rumour chatter recently about colourless spells - not sure what to make of it but perhaps there is a clue here in Ghostfire. Also - something else of interest in the above plot summary is the connection of the sage Anowon (perhaps a legendary creature we can expect in Worldwake?). Chandra and Sorin are said to hook up with Anowon and search for the Eye of Ugin. Once they reach the eye, they bump into none other than Sarkhan Vol. We already have several mentions in the flavour text of Anowon in some Zendikar cards . . .
"In these bloodstains I will find the fingerprints of our oppressors." "I don't care when the hedrons awoke. Why is the question that really matters." When Anowon, the Ruin Sage enters the battlefield, draw a card. Have a great New Year's Eve everyone. Yesterday was a surprisinly busy day here on the blog (just over 5,000 visitors again) with most MTG fans checking out the new Worldwake Art and Worldwake Intropack brochure. If ya missed, check yesterday's post HERE. In keeping with the theme of Worldwake art spoilers, we have two very cool playmats available from CoolStuffInc. featuring sweet / epic art. These playmats are provided by the distributors to stores based on the number of Worldwake booster boxes ordered. First one is rather obviously a Zendikar Kor Cleric working some big magic. 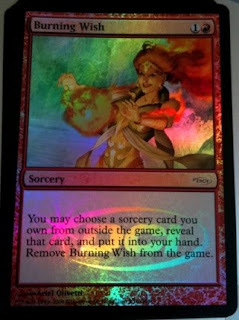 We will speculate some sorcery / enchantment with protection from black / red. 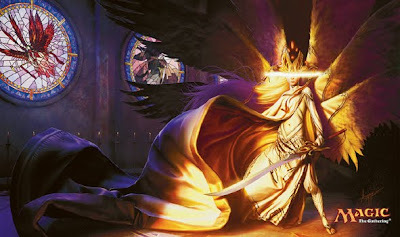 Second playmat art is featuring that beautifull Angel art we have been seeing on 'teh internets'. Is this the much speculated Worldwake 'Admonition Angel' or another creature ? ASIDE - We want to thank Sean C., formerly of 'The Guild' and now affiliated with 'The Wizard's Cupboard' for fabricating an awesome new banner using this beautiful Worldwake Angel Art. And now for something altogehter different . .
We realise that if you have not yet made any movement to acquire Christmas gifts, you may be well and truly farked but do not let that stop you from trying to slip into the spirit of the season. We hope to provide you with some unique decorations for your Christmas tree - - A MTG Tree Garland ! What you will need for our craft . . . Grab yourself all those foils that have been collecting dust and look for 'Christmas-y' colours - red, green, and white. Throw in some blue and black to mix things up. We suggest foil Bankslayer Angels and Elspeth, Knight-Errants . Using a hole punch, drop a hole near the top and bottom of the card. This hole is where we will use the string the tie together the next Magic card. Rinse and reapeat. Don't forget to alternate card colours to get the full mana spectrum represented. Finally, sting your garland up on your tree and wish all of your Magic The Gathering buddies a very merry. A Safe and Happy Christmas to all. Not much happening for Magic the Gathering Worldwake spoilers at the moment but we do have some Worldwake art for you to preview, so sit back and enjoy. Official previews will begin at Wizards on 1/18/2009, with prereleases and release events / parties on 1/30/2009 and 2/05/2009 respectively. Remember that excellent 'n' awesome Planechase spoiler Wizards ran last week (post HERE) ? Well here is some artwork with Jace the Mindsculptor with a bit of background - very obviously a Zendikar landscape. In addition to this, we have two other interesting Worldwake art pieces for you - The one of the left is unmistakeably a vampire while the one on the right certainly looks very demon-like to us. There is also another interesting image Wizards had used as a water-mark for their Worldwake Pre-Order Sheet. We would love to think that this Angel is the new 'n' awesome Worldwake Admonition Angel. And finally, one thing we look very forward to is getting to the game store and getting some dueling going with new intropacks. Here is the skinny as to the theme of the new Worldwake IntroPacks (sorry about the image quality). If you wanted to download this document in pdf format, head on over to Scribd, where we keep most of our MTG docs. Stay tuned for more MTG news, spoilers and opinions over your Christmas Holidays. Remember, all images are copyrighted by Wizards of the Coast LLC. We know that we had already previously provided a post about Magic The Gathering Christmas cards (HERE), but realise that if you do not work for Wizards of the Coast, getting one of these special Holiday Season's DCI foils will next slim to none and Slim already left town. To this end, we wanted to provide you, our loyal blog readers with something à propos that you would be able to share electonically with your MTG buddies. Please help yourself to the following images which in our opininon captures the spirit of the season (from our MTG gamers's point of view) . . .
Stay tuned during your Christmas Holidays as we may still have additional posts - yep - no social life here. 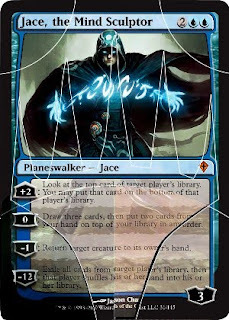 We have to hand it to Wizards that the slow Jace, the Mind Sculptor puzzle spoiler of the Worldwake Planeswalker Chase was brilliant. Fans were definitely on the edge of their seats in nail-biting anticipation. If we have any suggestions at all, it would be to have the last puzzle piece be the part which incorporates most of the loyalty abilities of the Planeswalker. As it stood, this particular piece (with the postivie / negative abilities) was spoiled in Toronto, a full three hours ahead of the last piece in California. The MTG fan community pretty much knew the full card by the time the last piece was picked up. As it stands, we feel it à propos to follow up yesterday's excitement with a short post dissecting the new Jace and it's potential in our world of casual standard-environment Magic the Gathering. Before we get into it, a quick review of this Worldwake card for reference. 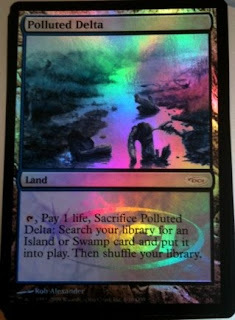 [+2] : Look at the top card of target player's library. You may put that card on the bottom of that player's library. [-1] : Return target creature to its owner's hand. [-12] : Exile all cards from target player's library, then that player shuffles his or her hand into his or her library. The first ability is +2 which in our opinion is decent. This will put up the loyality counters to 5 on turn one giving Jace some more body with withstand some red burn (read: Lightning Bolt) if you happen not to have a blocker up yet. This first ability is sweet. Of course this would have been even more nasty if the Morningtide Banneret cycle was still in standard. This ability first appeared on two cards in Future Sight and was properly called Fateseal. Altough this ability is too random to be effective, if luck is on your side, it can provide a measure of control over your opponent or be downright hazardous to them should the planets align. The second ability is pegged at 0 which esentially provides a free Brainstorm (Fifth Eiditon card). [Edit - we are retarded - please see Matt's comment - This means that one can NOT activate both abilities on the same turn.] This Ponder like abilitiy allows one to draw three cards which is never a bad thing in a format with fetchlands and cascade spells. One of the drawbacks to cascade to date was the randomness of it - not knowing what one was going to flip. This Brainstorm ability will allow one to decide whether or not to play that cascade spell in your hand and be able to know what cascaded spell will turn up. More control on cascade is just awesome in our opinion. We suggest that you consider the absolutely beautiful synergy this ability has with Enigma Sphinx. Whenever the Sphinx goes for that dirt nap in your graveyard, rest assured that Jace's second ability will find the Sphinx again next turn third from the top and set you up to cascade again. We are currently thinking about using Jace with Lorescale Coatl and Sages of the Anima for a big snake beater or flooding our side of the board with critters. The third ability is a -1 Unsummon. This ability is simply amazing. One can either teporarily remove an opponent's board threat or can set up some shenanigans with 'comes into play' cards. Players contemplating land destuction decks are now thinking about using this new Jace with Mold Shambler, Acidic Slime or Goblin Ruinblaster. There is a vast stable of cards which one may employ with this third ability; Kor Sanctifiers, Magister Sphinx, Meddling Mage, Parasitic Strix, or even just Zendikar Allies. This card will be starting off in the MTG Singles market at $15 but we are certain it will climb much higher as more the Worldwake gets spoiled / previewed. If you are Christmas shopping for a blue / control players, we are certain they will be most appreciative of this gift. 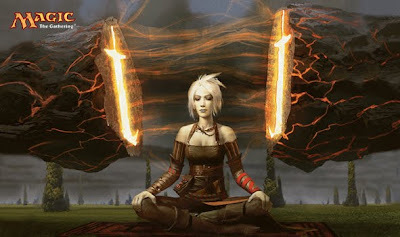 Today we have some Worldwake Booster back images and have also now arrived in the final stretch of the slow roll Worldwake Planeswalker spoiler. Jace, the Mind Sculptor has been dissected into 8 puzzle pieces and fired off to remote Game stores (hosting Wizards Play Network events). Today, Wizards revealed the final two co-ordinates . . .
No. 7 : 401 Games, Toronto, Canada - just about an hour south of me ! With the Winter Olypic flame touring through downtown Toronto, our new local hero, Bitey, was able to head into 401 games and snap a pic of the card piece just shortly after 11:00 am today . . . Many thanks to Bitey. Earlier, I had called Barclay Jewlers next door, and altough he was very polite, he really was unsympathetic and unhelpful in my mission to get someone over to pick up the Jace piece. Dang ! A zero ability - that is not only new but insanely broken ! This basically gives you a free Brainstorm each turn. Late Update - Around 7:00 PM or so (eastern standard time), an unknown fella by the name of Justin Phillips, just 15 minutes down the road from the store walked in to claim the final Jace piece. Thanks to Justin and GMI Games for getting this all together - thankfully it was not the positive / negative ability side as this would have certainly felt like the longest day of MTG spoiler, like evar. w0w ! - just awesome. We think the folks who had been complaining about the decay of blue are most likely smiling now . . . if not, there really is no pleasing them we guess. Expect this card to start off selling for about $40, and who knows after that. Now - onto the next Worlwake spoiler goodness . 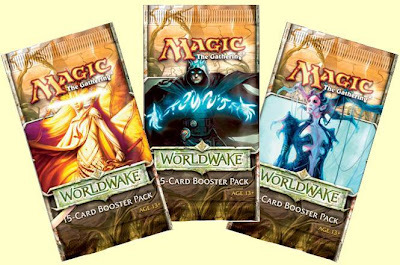 . . Worldwake Booster Pack images. We have a trio of booster pack images from Wizards today. 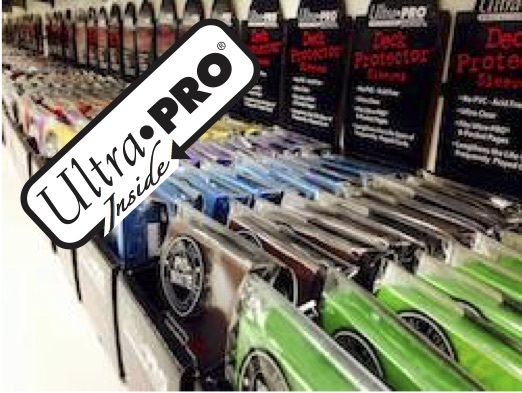 For the first pack we have an unknown Angel which was recently featured on some Ultra-Pro product. 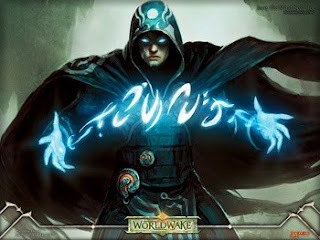 The second pack we have the new Worldwake hotness, Jace, the Mind Sculptor. As for the third pack, this features a Vampire - this art was provided on the back of some token cards earlier and it appears she is accompanied by a Mindless Null. Stay tuned for more Worldwake awesomness.